Frank Thomas watch the game from the Tide bench. Just 7,500 fans came to Denny Stadium on Nov. 24, 1945 to see the No. 3 ranked Crimson Tide crush the Pensacola Naval Air Base Goslings 55-6. The Tides' first string scored three touchdowns in their first three possessions and then left the rest of the game to the backups. 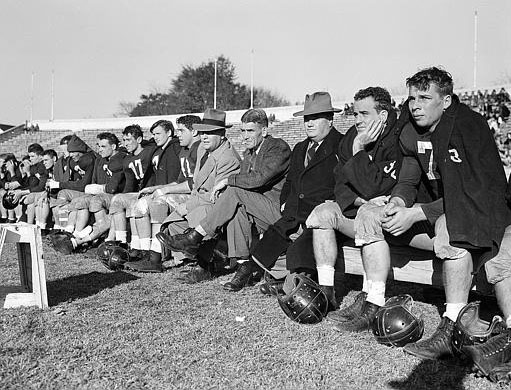 It was the eighth straight win for Alabama who had just been invited to play in the 1946 Rose Bowl game.